Nope, not the least bit racist is it? but you are more than forgiven should you decide it better to bypass the pleasure. How would you respond to this crazed, hate-filled, murderous Jewess and her equally psychopathic Jewish terrorist friends, backed by the AIPAC/Jewish lobby in the United States, if they came into your vibrant, beautiful town or city, and surreptitiously sought to take over the place by horrific acts of premeditated, vengeful hate and genocide? Meet the Jewess Miriam Levinger, a native of the Bronx, New York; and Mother of the Israeli settlers in the West Bank, and co-founder with her husband Moshe of the notorious Kach terrorist outfit. Notice that this Jewess’s irrational, hate-filled, murderous attitude towards Christians and Gentiles is rooted in the Jews’ national rejection of Jesus and the gospel in the first century. A heinous crime the Jews have refused to repent of, because of their pride and hardness of heart, and jealousy of Gentiles who’ve obviously been blessed by God instead of them, by receiving Jesus as Israel’s messiah. If you are a glutton for punishment here is Part Two of meeting this delightful woman. Crazed Jewess Miriam Levinger has been living illegally as a colonial occupier in Al Khalil / Hebron, supported by the United States government, and effectively licensed by the same to carry out acts of genocide against the indigenous people of the place. Miriam Levinger and her fellow settlers have conspired together, in collusion with the Israeli army and police, to make the lives of Arab and Christian families in the West Bank a living hell, in a deliberate, hate-filled attempt to force them out of their homes and off their land. As we all know, sadly, this is the sorry reality in most West Bank cities today. Israeli genocides in places like the West Bank are funded by the U.S. government, from the coffers of the U.S. peoples’ tax money to the tune of around $12 million a day. 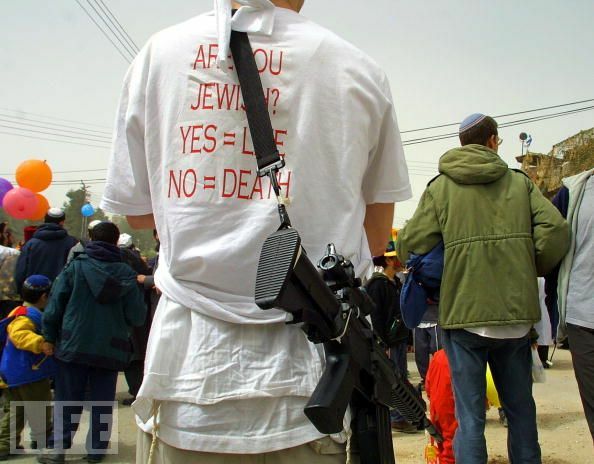 Most Gentile Americans have little or no idea of the true nature of the ongoing acts of Jewish theft and murder perpetrated in the West Bank; and Christians are willfully blind to their complicity in the Jews’ sins of theft and murder facilitated by the money they provide. I have always been rather fond of this beautiful Israeli girl.T'is a pity she is so twisted with hatred. Something doubtless being paid back by God, when they, and their own sons and daughters in the U.S. military, are maimed and killed, when fighting no-win wars for the Jews and their corporate buddies and drug dealers in places like Iraq and Afghanistan.